Since it's gotten a lot of discussion, I think it deserves its own thread. So the question is this: do electrons necessarily rotate? What kinds of rotation do electrons experience? Are there physical consequences of these rotations? For what concern me, electrons don't rotate. As always, in physics this doesn't mean that the opposite couldn't be true one day, but only that, for what we know NOW there isn't any experimentally verified inner rotation. Electrons possess a quantum mechanical property known as spin which is very similar to rotation but it can have only one of two opposing values usually described as up and down. This means that electrons are a bit like magnets and tend to like to group in pairs. Rotation → spin = angular momentum → magnetic momentum (if it's charged). spin = angular momentum (not→) rotation (in the quantum world). In answer to the direct question "Do electrons rotate?" I'd actually say no. That might surprise you, but I'll come back to it. If the question was "Do electrons involve some form of rotational motion" I'd say yes. Electrons do exhibit the properties of angular momentum and magnetic moment, see magnetic moment of electrons and electron magnetic dipole moment. We all know that electron's spin 1/2 isn't the typical spin of say a rotating billiard ball, and precise measurement of say the g-factor confirms this, bringing in the anomalous magnetic dipole moment. However what's called mainstream physics rather gives up at this point, saying "you cannot understand it classically". It doesn't offer an electron model that gives any conceptual grasp of pair production or what the electron actually is, saying instead "it's an elementary particle" or "it's a point particle", missing the fact that the electron can be created and destroyed, and a point particle cannot exhibit angular momentum. Moreover there seems to be a refusal to entertain papers by bona-fide physicists that attempt to offer answers, or at least ideas. Such papers receive little attention, and instead we read of Boltzmann brains, parallel worlds, and other matters for which we have no actual scientific evidence. I find this an extraordinary situation, to say the least. The thing is, rotation can be subtle. If I ask you to look at a clock and say "Which way are the hands rotating? ", you'd say clockwise. But suppose it was a glass clock, and I took you round the back. Those hands are now rotating anticlockwise. In similar vein if we fly around the equator of the earth, we can easily distinguish between an East→West and a West→East rotational motion. But suppose we added a South→North rotational motion, such that we now head North-West, go round the back of the Northern hemisphere, come down from the North-East to head South-West, then go round the back of the Southern hemisphere and come up from the South-East. We're describing a folded figure-of-8, and we're continuously changing direction. Which way are we spinning? It's difficult to say. 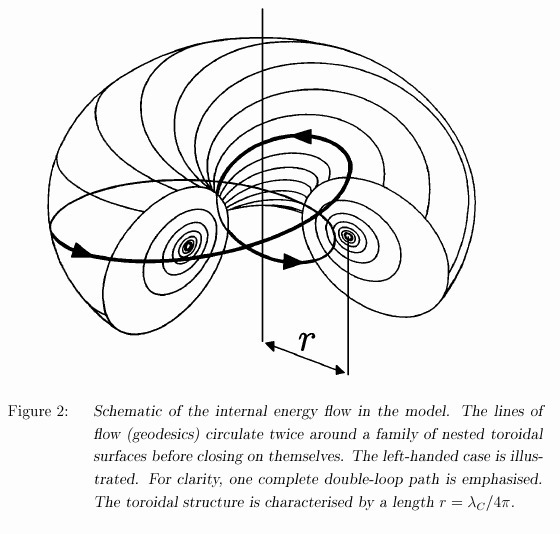 For me, this is enough to look seriously at real rotational motion, like the Williamson / van der Mark depiction below. The dark black line is the figure of 8, but rather than wrapping round a sphere, it and the other trajectory lines delineate a torus with a spin 1/2 feature like the moebius strip. So, to return to the original question: "Do electrons rotate?" I'd say no, because the situation is something like a whirlpool where the water rotates. The whirlpool only exists because of this rotation. The whirlpool doesn’t rotate, the water does. After pair production, we don’t see any 511 keV photons conveying energy/momentum at c. Instead we see angular momentum and magnetic moment, et cetera. The scientific evidence seems pretty conclusive, whatever the maths. However you model the electron, that photon is stuck in some kind of 2π loop. Only now we don't call it a photon any more, we call it an electron. And of course, light travels in straight lines, so yes, we do Need to Talk About Kelvin because of http://www.math.buffalo.edu/~menasco/Knottheory.html. You call it fringe, I call it leading edge, but time will tell as to what it really is. I agree on that spin is defined as having an 'angular momentum' but there is one important word missing.
. . . Intrinsic . . . Experimental evidence like the hydrogen fine structure and the Stern-Gerlach experiment suggest that an electron has an intrinsic angular momentum, independent of its orbital angular momentum. These experiments suggest just two possible states for this angular momentum, and following the pattern of quantized angular momentum, this requires an angular momentum quantum number of 1/2. The definition of intrinsic is as follows " Belonging to a thing by its very nature." In the same way as photons are intrinsically massless and timeless. * The spin of a charged particle is associated with a magnetic dipole moment with a g-factor differing from 1. This is incompatible with classical physics, assuming that the charge and mass of the particle are distributed evenly in spheres of equal radius. Particles with half-integer spin obey Fermi-Dirac statistics, and are known as fermions. They are required to occupy antisymmetric quantum states (see the article on identical particles.) This property forbids fermions from sharing quantum states – a restriction known as the Pauli exclusion principle. Particles with integer spin, on the other hand, obey Bose-Einstein statistics, and are known as bosons. These particles occupy "symmetric states", and can therefore share quantum states. The proof of this is known as the spin-statistics theorem, which relies on both quantum mechanics and the theory of special relativity. In fact, "the connection between spin and statistics is one of the most important applications of the special relativity theory". So we have a definition coined because it reminded us about angular momentum, not that it was anything like it. So, to treat it as a rotation seems less than correct. That's a cop-out non-answer, yor-on. Really. It's like saying surpasseth all human understanding. "Experimental evidence like the hydrogen fine structure and the Stern-Gerlach experiment suggest that an electron has an intrinsic angular momentum, independent of its orbital angular momentum. These experiments suggest just two possible states for this angular momentum, and following the pattern of quantized angular momentum, this requires an angular momentum quantum number of 1/2". No problem with that. The moebius strip exhibits this feature, as does the Williamson / van der Mark and the Qiu-Hong Hu electron models. See http://arxiv.org/abs/physics/0512265 for the latter. This might not be mainstream yet, and it has not yet hit the media or the textbooks. But I assure you, the moot word is yet. "Ralph Kronig, one of Landé's assistants, suggested in early 1925 that it was produced by the self-rotation of the electron. When Pauli heard about the idea, he criticized it severely, noting that the electron's hypothetical surface would have to be moving faster than the speed of light in order for it to rotate quickly enough to produce the necessary angular momentum. This would violate the theory of relativity." There is no surface to the electron, just as there's no surface to an electromagnetic wave travelling through the bulk of space, or to a seismic s-wave travelling through the bulk of the earth. The bottom line is that Pauli didn't understand the electron. As above. We do science to understand things, not give up on them. And we do understand why the photon is massless and timeless - you can't change its speed and since it travels at c it is subject to infinite time dilation. This is incompatible with classical physics, assuming that the charge and mass of the particle are distributed evenly in spheres of equal radius. Particles with half-integer spin obey Fermi-Dirac statistics, and are known as fermions. They are required to occupy antisymmetric quantum states (see the article on identical particles.) This property forbids fermions from sharing quantum states – a restriction known as the Pauli exclusion principle2. It is compatible with classical physics, but not with the rotation of spheres. All you need is a stress-energy rotation in two dimensions. That means the rotational direction constantly changes, which is why you can't say which direction it's going. All you can do to change it is go backwards, then you have the opposite spin. And as for the Pauli exclusion principle, two waves can ride over one another, but two whirlpools cannot overlap. It's a rather simple picture once you see it, and it works. "Particles with integer spin, on the other hand, obey Bose-Einstein statistics, and are known as bosons. These particles occupy "symmetric states", and can therefore share quantum states. The proof of this is known as the spin-statistics theorem, which relies on both quantum mechanics and the theory of special relativity. In fact, "the connection between spin and statistics is one of the most important applications of the special relativity theory". It is angular momentum. And there's magnetic moment in there too. The g-factor is a correction factor, and it's 2.002319. It isn't quite 2, but that 2 should tell you something. As should the fact that the magnetic field is associated with curl aka rot aka rotor. There's definitely something going round and round. I'm sorry yor-on, but it's not scientific to say it's something intrinsic that we cannot understand. That's not enough to oppose deductive logic backed by evidence and peer-reviewed papers. Look to pair production, where mass and charge and all those electron properties are created by doing something to light so that it no longer propagates linearly at c.
Math and words sometimes seems to have problems 'coexisting'? As for you saying "I'm sorry yor-on, but it's not scientific to say it's something intrinsic that we cannot understand." I'm afraid I have to state that my opinion is just the opposite It's when we have moved from that word to 'knowing' what gives those properties we are truly scientific. 'Intrinsic' is a definition very near to singularities as I see it. There, existing, but very hard to understand for me. And btw, it's not my idea defining them as 'intrinsic'? It is to do with angular momentum, see the papers for the maths. The whole point is that there is no old idea, and people accept this deficiency whilst making light of the experimental evidence of pair production, angular momentum, magnetic moment, etc. It's all locked away in a blind spot called "intrinsic spin", and people can't see their blind spot. See this quote from that hyperphysics page? "With this evidence, we say that the electron has spin 1/2. An angular momentum and a magnetic moment could indeed arise from a spinning sphere of charge, but this classical picture cannot fit the size or quantized nature of the electron spin. The property called electron spin must be considered to be a quantum concept without detailed classical analogy". We all know an electron is not a spinning sphere. But to then say there can be no classical picture is a non-sequitur. The phrase must be considered to be a quantum concept without detailed classical analogy really does equate to surpasseth all human understanding. That's dogma, not science. It would be if his answer wasn't actually based on the experiments that people have done with electrons. The reason why it is not mainstream is that the proposal you have linked to is something published in a crank journal. There are simply some publications that one cannot take seriously and Physics Essays is one such journal. If someone is publishing their work their, it is almost guaranteed that it is of little or no value. And as for the Pauli exclusion principle, two waves can ride over one another, but two whirlpools cannot overlap. It's a rather simple picture once you see it, and it works. Then demonstrate how it produces the results of QM experiments. That's what "it works" must mean in this context. I'm sorry yor-on, but it's not scientific to say it's something intrinsic that we cannot understand. That's not enough to oppose deductive logic backed by evidence and peer-reviewed papers. The only one here ignoring the science is you, Farsight. For example, you are entirely ignoring the results of the Ster-Gerlach experiments and other experiments that back up exactly what yor-on is saying. Additionally, you have not provided any peer reviewed research to support your opinion, you have only provided a single article on a pre-print archive that is far from peer reviewed, an article that is, at best, printed in a crank journal. A paper with very few citations (2 that I could find). This means it is science that scientists do not take seriously. We do understand electron spin, we have just been forced to the conclusion that it is significantly different from angular momentum. Look to pair production, where mass and charge and all those electron properties are created by doing something to light so that it no longer propagates linearly at c.
If you can show exactly how your idea of pair production recaptures all of the properties of an electron going through a Stern-Gerlach magnet, then go ahead. Let's see how you predict the experimental results that people get every day from these devices and ones like them. Physbang although I agree on physicists being able to manipulate this property in logical (and at times even a-logical:) ways they still haven't made me understand what they really mean by it. I would gladly pass them by (electrons) if I did, but as it is they confuse, as well as fascinate, me with their entanglements etc and the way they are 'quantized' as so much else, ah, down under . Most of quantum mechanics is really weird, and although we can grasp its mathematics, I don't think anyone can really intuitively understand it. The way tiny things behave is just so alien to our everyday world. Spin is an example of one of those things that just doesn't show up in everyday life, but which nevertheless appears to be true. I don't see why we should really expect things that are extremely far outside of our everyday view of the world to behave in an intuitive manner. I think the ultimate test of these theories is (and should be) whether or not they hold up to experimental scrutiny. So far, spin has done so. Like other posters here, I'm not sure how the electron model you described, Farsight, would be testable. If it does predict exactly the same properties that are shown by an actual electron, then it's worth considering further. However, new proposals in science are everywhere, so its up to the one proposing them to rigorously show how they satisfy existing tests and also how they predict new phenomena or fix problems with the current theory. Having said that, I think that the description of an electron (and other fundamental particles) as having sub-structure that geometrically accounts for spin is something that string theory is trying to come up with. I'm not an expert on string theory, but I know that those who are have demonstrated that it is compatible with current physics, although they haven't come up with new testable predictions yet. Edit: I hate to link to the wiki on a point where I'm not very familiar with the subject, but if this is true, it seems to cover most of what your electron model claims to solve, Farsight: http://en.wikipedia.org/wiki/Relationship_between_string_theory_and_quantum_field_theory . In particular, it explains spin as the rotation of a string, and it would explain pair production as the splitting of these strings. Maybe someone with a better grasp of string theory could enlighten us further. The problem with string theory is how we should see it. It starts from one dimensionality as I understands it? A one dimensional surface, as observed here in 3D + time? I say we can pack them on, into infinity, without making them interact. They are one dimensional after all. Okay, I can accept that they will interact geometrically from some 'perspective' at the same time as they won't interact (or even be seen to exist) simultaneously for another observer observing them from another position (angle). Although this makes a lot of sense, to me at least. "renormalization: in particle physics the behaviour of particles in the smallest scales is largely unknown. In order to avoid this difficulty, the particles are treated as point-like objects, and a mathematical tool known as renormalization is used to describe the unknown aspects by only few parameters, which can be adjusted so that calculations give adequate results. In string theory, this is unnecessary since the behaviour of the strings is presumed to be known to every scale." Yeah, is there anyone here that can relate strings to SpaceTime here? So, rereading myself. Sure, a one dimensional 'place' knotted by 'times arrow' and 'time' will then have a higher probability to my eyes than the idea of 'dimensions' as something we 'cut and paste' as needed. After all, there are no two dimensional objects inside SpaceTime as I know of? And to prove that you will need to show me how it will disappear from one angle being in the same 'frame of reference' and at the same time as my coworker on the other side (angle) still can see, as well as 'touch', it? So is there any string theories that looks at it that way? I haven't heard of them? On a similar but (maybe this will need a new thread too?) connected thought. How exactly can a electron transition in its orbitals, does it take time? It should, shouldn't it, are there some immediate time when it won't 'exist', that is if I assume that it will be a 'new orbital' made by a 'new electron' created due to interaction with something else. If I move a atom inside a electromagnetic field created by a permanent magnet I will 'transfer energy' to it, won't I? The way i transfer this energy is via 'virtual photons', am I right there? So then this electron orbital will change, right? So, how does it do it. By destroying one 'electron orbital' and creating another orbital, or by changing the probability of where it is. And does it take time, and is there a moment when it won't 'exist' in between those two orbitals. 'Exist' as I use it here can either be seen as gone, nada, not there at all.. Or as a probability of it being superimposed I guess? Like negated by being at two places simultaneously, which should unbalance it, as it seems to me? The way electrons change their orbitals is very interesting and not well understood, and the way photons of very similar frequencies are produced can be very different. Let me explain. It is possible to visualise this by saying that the short lived photons are only a single wave while the long lived ones have many waves in their wave packet. This effect occurs all the way from radio waves in communications to gamma rays and collections of photons from different processes with the same nominal frequency can gave different bandwidths. The one and very important feature that I have never had a clear answer for is:- Is bandwidth an inherent property of a single photon or is it only observable in collections of photons from a particular source? and I have asked this question of some pretty good scientists. The only reply i have ever received is That is a good question I will have to think about it. I have never been able to think up an experiment that could prove this either way so maybe this question just cannot be answered. And I mean it sincerely. F.ex I presume that there is a similarity between the shortlived wavepackets having a broad bandwidth and a virtual photon, in that they also can have a very high energy, a little like virtual photons can have an undefined energy, just because they go under Plancktime? Or am I wrong there? And that bandwidth here refers to their 'energy', sort of? If I would look at it as a photon? If we were talking about the electrons emitting them I would think of some sort of 'vibrational mode' emitting certain waves? How is a single photon thought to be able to emit/contain several waves? As a wavepacket I think I can accept it, even though it seems that if we assume that the shortest 'real' wavepacket possible will have to be at Planck size it then will have a length of '1' but f.ex then containing, how many possible waves? But I have definite difficulties conceptualize it as a photon at the same time? I'm rather sure a physicist told me that single photons have their own coherence and so their own bandwidth. About an experiment to prove it, I would say fire single photons through a diffraction grating and analyze the spectrum after a large amount of detection events (but I'm not completely sure it would work, anyway).